The DSR-1800 is the successor model to the DSR-80. Implementing the innovative, high standard technology featured in the DSR 2000, the DSR-1800 boasts improved jog audio, slow motion and editing performance. The DSR 1800 has a full range of digital interfaces such as SDI, i.LINK, AES/EBU and also analog Component I/O. 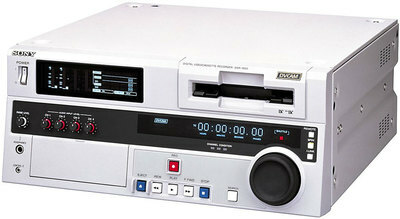 It is designed to playback DVCAM tapes, DV tapes recorded in both SP/LP modes, and even DVCPRO tapes (*DVCPRO tapes are not compatible with SDTI and i.LINK). Rent the Sony DSR-1800 DVCAM Deck from Deck Hand Camera Rentals Today!